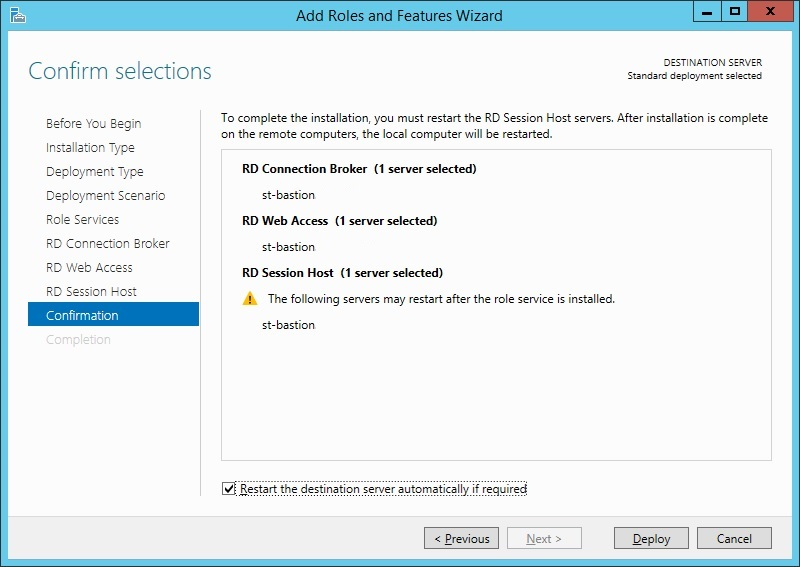 This section explains how to install Microsoft Remote Desktop Services (RDS) on a Windows server host. If multiple jump servers are used, Privileged Identity does not require them all to run on the same operating system. 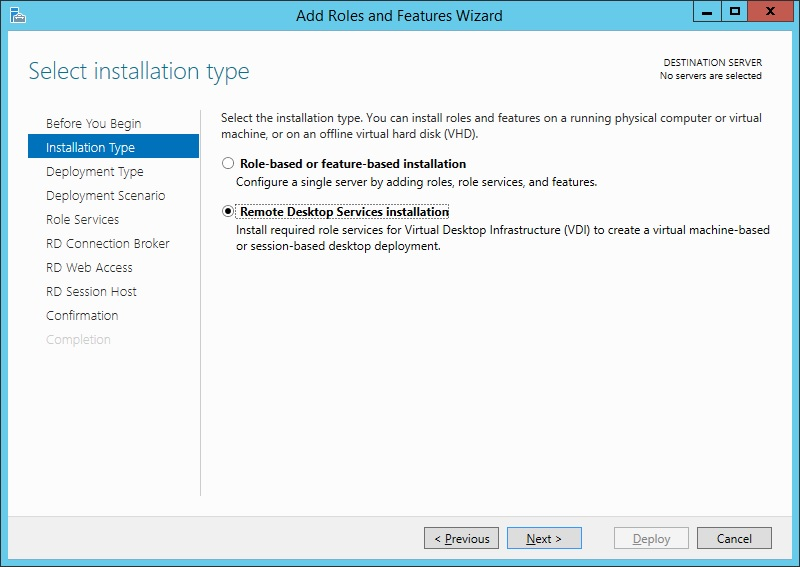 However, they all need to use Windows Server 2012 R2+. We recommend using the most current version of Windows Server. Privileged Identity uses a single login account to connect to the jump server. This account is used to launch applications, and it does not have to be an administrator account unless a specific application requires administrative rights to run. If the account is not configured as an administrator, it must be granted the right to log in via RDS. 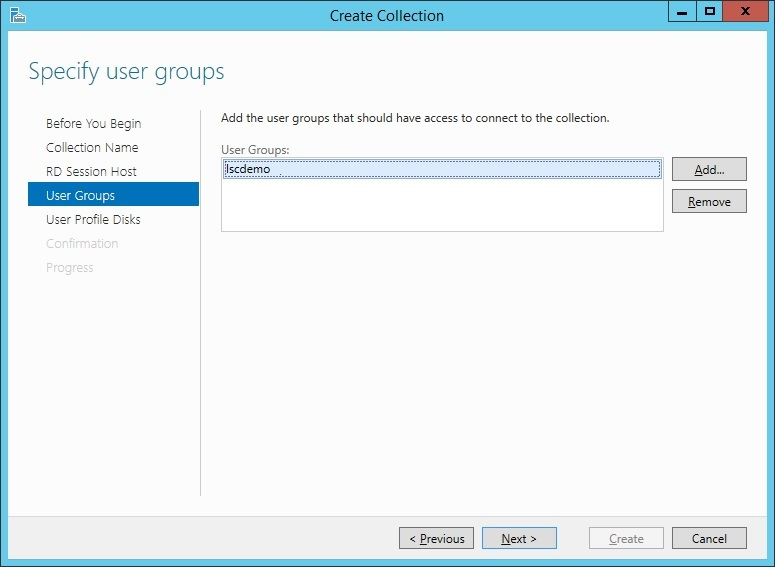 This can be granted by adding the account to the Remote Desktop Users local group. Open Server Manager. Select Add Roles and Features. 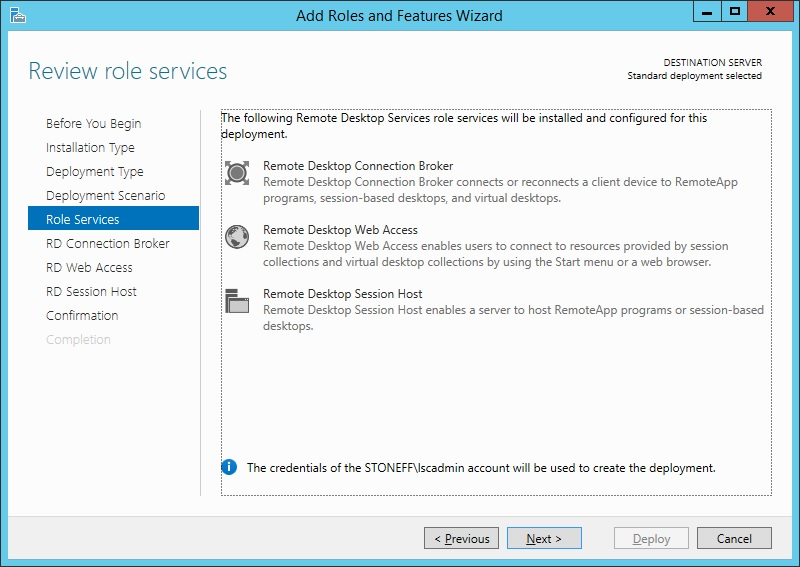 On the Select installation type page, select Remote Desktop Services installation. Click Next. 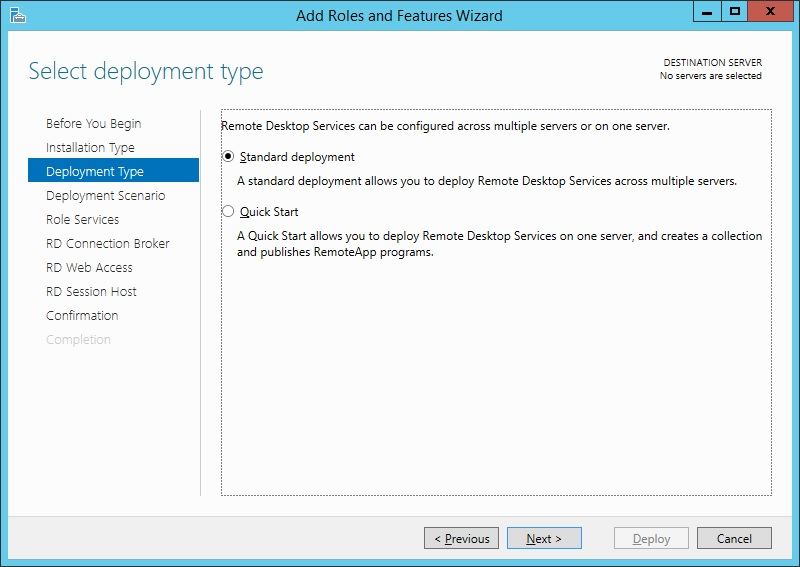 On the Select deployment type page, choose a deployment type and click Next. 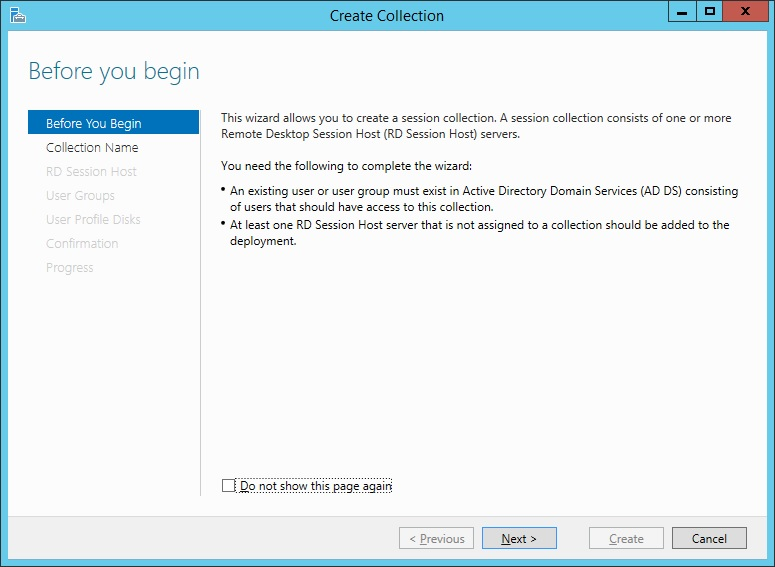 Selecting Standard deployment requires the administrator to configure a collection post-RDS installation. The Quick Start method is faster and automatically creates a collection. However, it also adds and publishes additional applications that are not needed and does not provide configuration options. 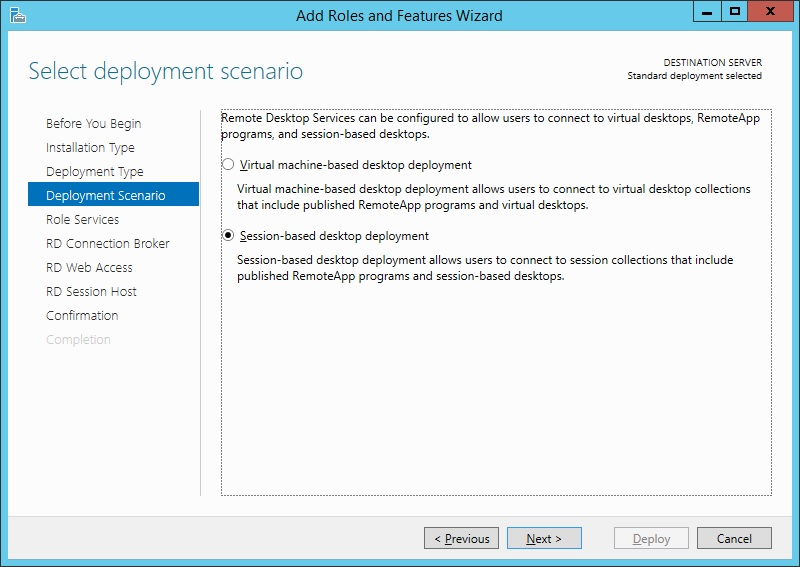 On the Select deployment scenario page, select Session-based desktop deployment. Click Next. 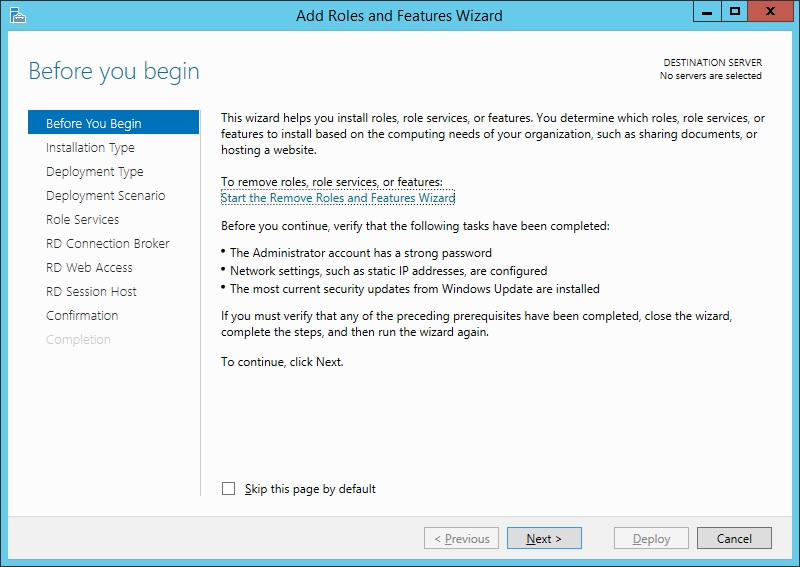 Click Next on the Role Services page. 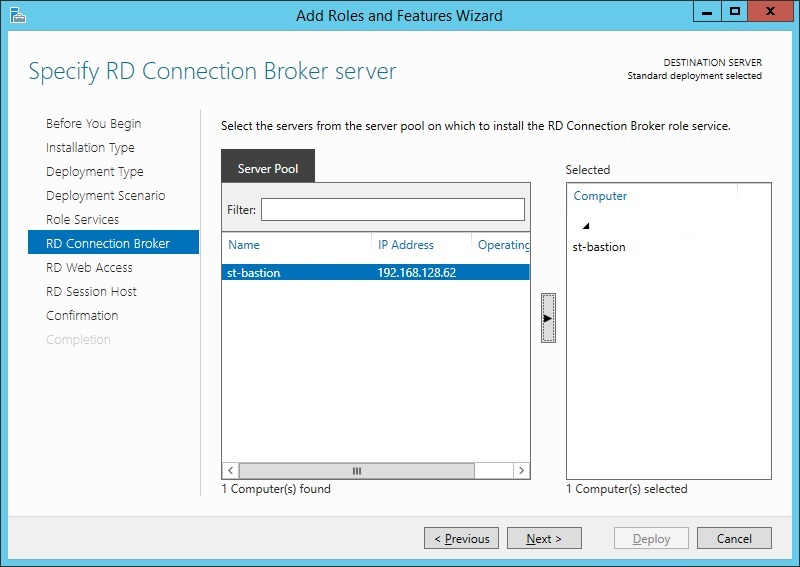 On the Specify RD Connection Broker server page, select the server from the Server Pool field. Add it to the Selected computer field by clicking the arrow between the two fields. 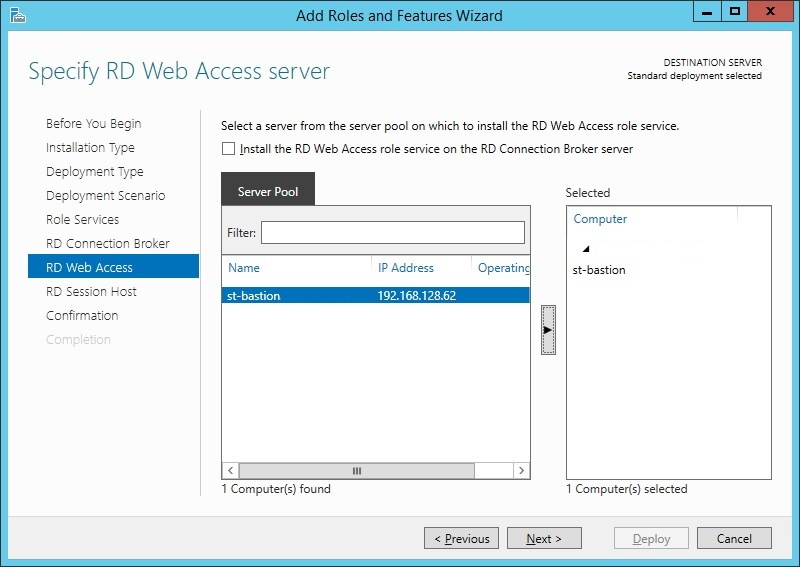 On the Specify RD Web Access server page, select the server from the Server Pool field. Add it to the Selected computer field. On the Confirm selections page, click Deploy. If required, restart the host. After restarting, open Server Manager > Remote Desktop Services. Click Collections. 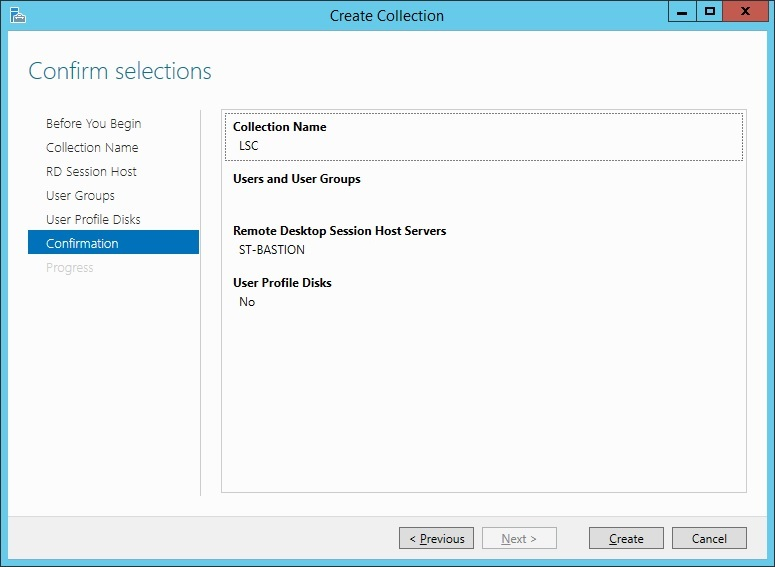 At the top right corner, select Tasks > Create Session Collection. On the Name the collection page, supply a friendly name for the collection and click Next. The collection name should be 16 characters or less (due to Microsoft design limitations). 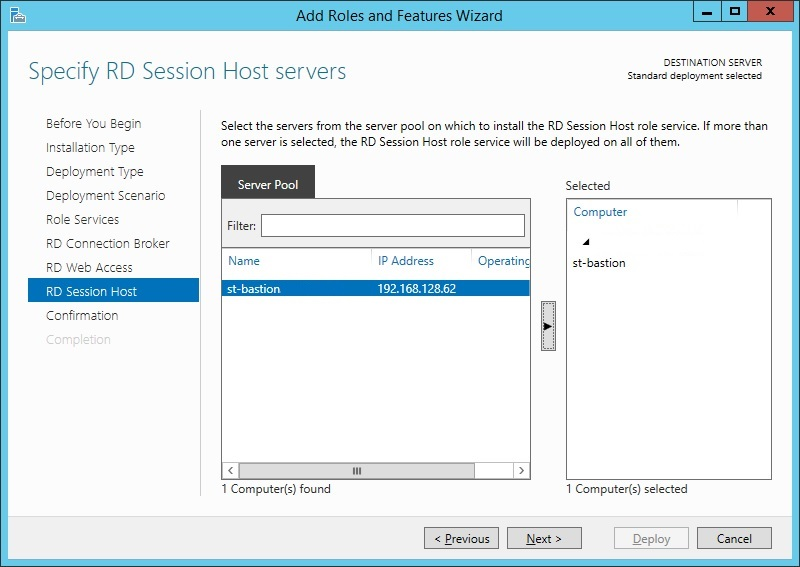 On the Specify RD Session Host server page, select the server from the Server Pool field. Add it to the Selected > Computer field. Click Next. Select a proxy account to connect the jump server to prior to launching the selected application. 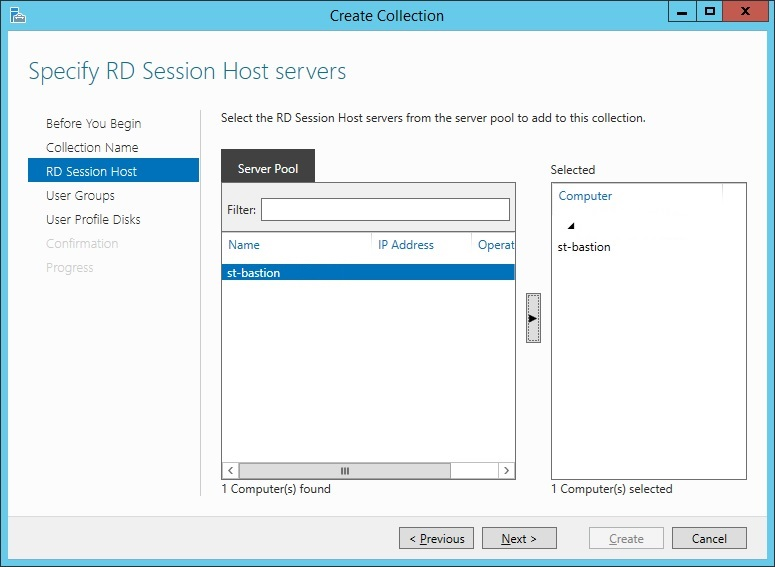 This account either needs to be added to a group that can RDP to the target jump server to launch subsequent applications, or the account should be added directly as a user that can connect to the RDP session host server. 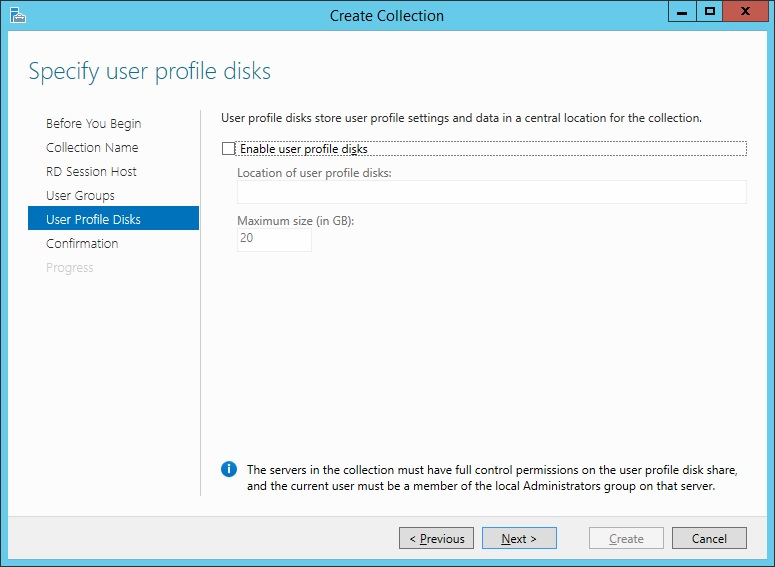 On the Specify user profile disks page, click Next. On the Confirm selections page, click Create. An empty collection is created.